I went looking for ingredients for the slow-roasted salmon recipe below. I always check out the olive and pickle bar when I’m in Whole Foods store. I can usually find an old favorite or something exotic or new to try. There was a pan of drunken tomatoes – yellow tomatoes marinated with garlic, herbs and red wine. They were eye catching and the tart marinade smelled amazing. I had to try some, of course. I added extra marinade to the container and, at home blended some olive oil with the marinade and a pinch of salt and pepper and used this vinaigrette as a dressing for a bed of greens. A small herbed flatbread cracker on the side added crunch. I am now a drunken tomato fan. 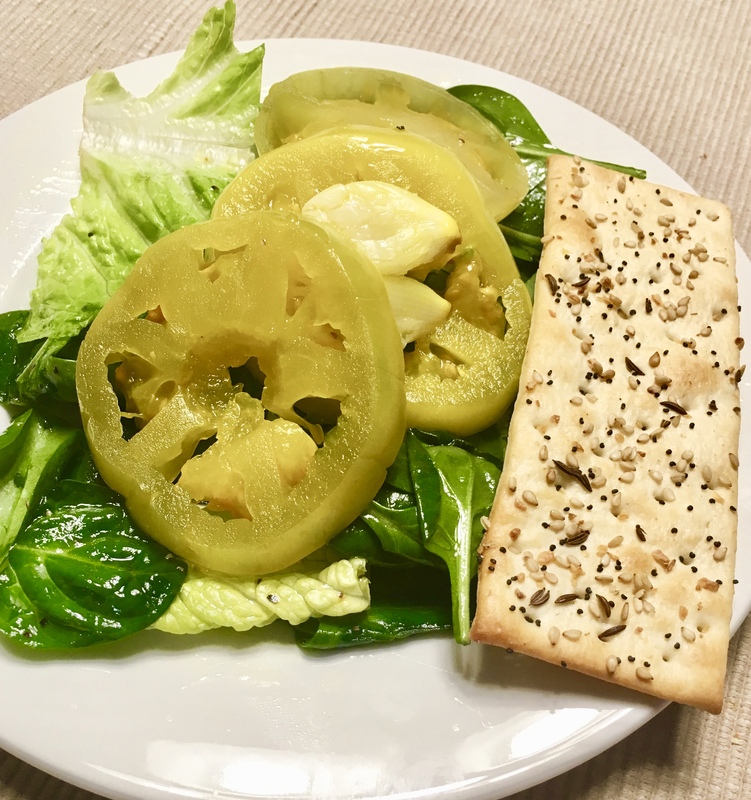 I didn’t think this tart salad would work well plated with with the citrusy salmon, so I served it as a first course with a couple of extra crackers and butter to cleanse the palette. Any excuse for crackers and butter works for me is a good one. How can you go wrong with four things you love? 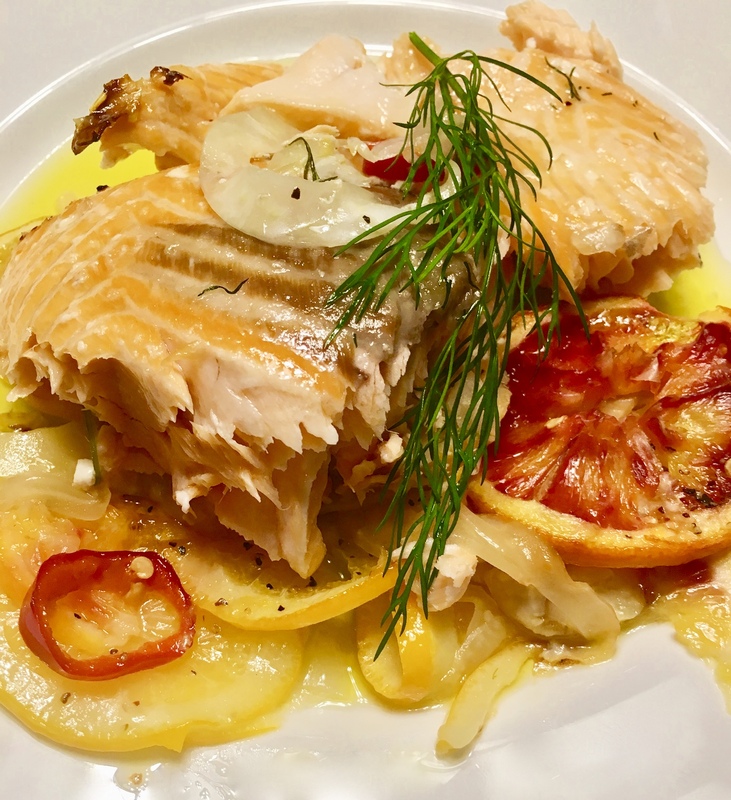 A recipe with blood oranges, Meyer lemons, fennel and salmon was a must make. The flavors were a great complement for each other. A few dill springs made a great quintet of tastes. I think that 3/4 cup of olive is a bit much. Next time I’ll use less. Flaky sea salt (such as Maldon) for serving. Transfer salmon to a platter, breaking it into large pieces as you go. Spoon fennel mixture and oil from baking dish over; discard dill sprigs. Season with sea salt and pepper and top with fresh dill sprigs. Use a spoon to break the salmon fillet into perfectly imperfect pieces.